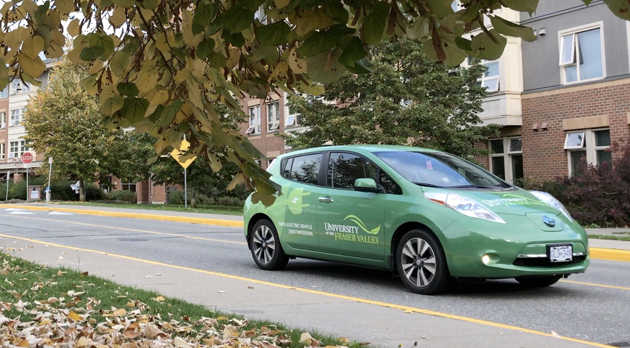 The university’s facilities management team replaced an old shipping van with a UFV-branded 2015 Nissan Leaf S that provides a clean alternative during the frequent trips to and from the regional campuses. “The purchase of this electric vehicle is making a statement that UFV is taking sustainability and a green revolution seriously and we’re moving forward with that,” said Blair McFarlane, UFV’s energy manager. And the vehicle acquisition checked off a number of other boxes for the university, according to McFarlane. Facilities is saving on all of the gasoline that would have gone into a replacement carbon-burning vehicle, as well as the oil changes, and the maintenance that comes with internal combustion engines. He did the math and it was clear­: with an annual cost savings of almost $5,500 the Leaf would pay for itself in 4.6 years. This year Facilities worked with Ancillary Services to install two Level 2 charging stations: one each at the Chilliwack and Abbotsford campuses. While this new EV is operated through the Facilities department and predominantly used by janitorial, building maintenance, and mechanical maintenance staff to shuttle themselves and their materials between different campuses, McFarlane forecasts a variety of UFV electric cars.